A repeat client is Jessica Alba (“my greenest client by far”, she tells) who has employed Whitman’s creative nous on three houses. Kristen Bell is another (“my most dog friendly client”) and a collaboration with Melanie Griffiths and Antonio Banderas’ home was a recent project. Passionate, successful, artistic, resourceful, compassionate and very eco-friendly too in her work, Kari is an inspiration to anyone interested in interiors! Wearing blue green jeans, a black cardigan and statement necklace, this creative lady oozed imagination and innovative ideas as she chatted to a packed audience at Decor and Design. With an office in Aspen, this Colorado resident believes that the lines between art and design are blissfully blurred; and that includes interior styling and expressionism too. “Nothing should be conventional if you’re being creative,” she says. Creative powerhouse, Kari Whitman: interior designer to the stars, passionate about eco friendly practice and rescuer of many LA dogs. And that includes sourcing to, as for this creative decorator, rummaging through flea markets, vintage stores, architectural salvage yards, Craig’s List and antique sellers pays off. “For little money, you can find the coolest stuff,” she gushes. Then again, she’s not afraid to make a big purchase when needed either. While she believes in styling homes as an way of expressionism, she’s also – like any good interior designer – all about the clients’ needs. One tip she’ll share with other interior stylists and designers is to search out local craftsmen and artists who make “cool stuff” to be called in to projects if needed. For other fossickers, take note of how it’s done: storage. Whitman has seven storage lockers all bursting with unique treasures from all around the globe, just patiently waiting to meet their new owner (aka Whitman’s client) when the time is right. She’s also a fan of using her clients’ existing belongings and updating it with a fresh new look. A big animal fan, she’s also started the Ace of Hearts rescue dog foundation and admits to spruiking this to her clients. According to this animal lover, not even all the styling and perfect buys in the world can bring about what only two pairs of grateful furry legs can. “The only thing that can bring the best vibe into your home is a rescue dog,” she tells. For sunny California, an indoor/outdoor living area is a must. Imagining a beautiful view from this vantage point! An old Persian rug, full of character, ushers visitors into this creative and modern home. It’s not just about the bath though, what a shower! This Hollywood home is full of indoor/outdoor spaces for ease of living. Love the wooden feature on the table for a natural look. And, as for her own house in Boulder, Colarado , this creative lady has truly made a resourceful and intriguing haven. Gorgeous! A unique metallic lighting feature/art installation! Nautical theme, feature pendant…look at all those gorgeous other lights too! More nautical lights, curved lighting and a pop of red – Whitman admits to loving this vibrant hue. Studded blue feature chairs meets different shaped and perfectly matching chairs in the dining room, all complemented by dark wood floor and lots of natural light. The nautical theme continues on in her bedroom, look at those lovingly made unique lights – hanging off a rope! This Flavor Paper wallpaper is one of Whitman’s favourite travel photos enlarged and stretched out on a wall stick on! 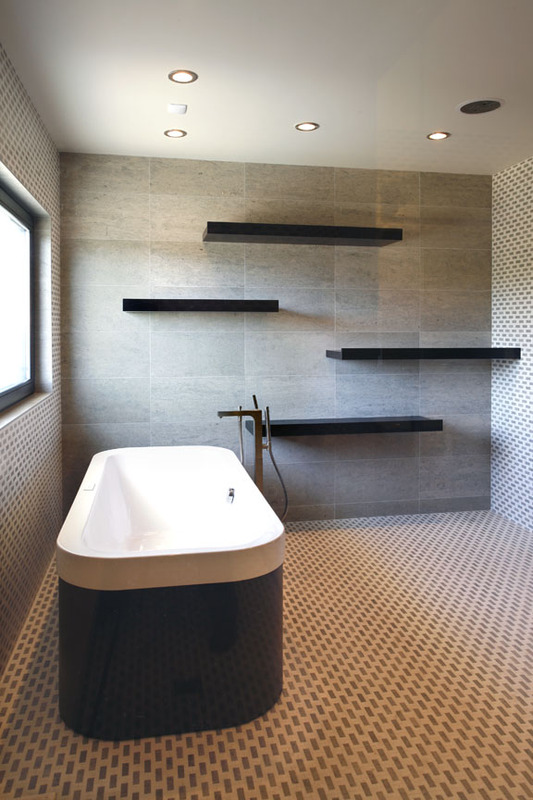 We see the favourite wallpaper used again in an unexpected and brilliant way, leading to this black and white bathroom. Art Deco meets unique expressionism! Wood meets moody black in this modern bathroom. Kari creatively used some of her favourite photographs as a stick on wall print: a great tip if you’re wanting walls with meaning!